Congress President Rahul Gandhi on Saturday sought to bring Prime Minister Narendra Modi in the line of fire on the PNB banking scam saying he should explain how Rs.22,000 crore was "taken" away from the country's banking system by jeweller Nirav Modi, the main accused, after the demonetisation.He said 90 per cent of the scam took place during the NDA regime and wanted to know what action would be taken in the whole episode. "This started on November 8, 2016 when Modiji turned 500 and 1000 ruppee notes into a scrap. He took out all the money from people's pockets and put it in the banking system. The strange thing is Modiji (Nirav Modi) takes away Rs. 22,000 crore. The Prime Minister teaches students how to take exams for one hour and 45 minutes. But he can't tell the nation that Rs. 22,000 crore, the people's money which Nirav Modiji snatched away, who is responsible for this," he told reporters at the party headquarters here. Referring to the silence of the Prime Minister and Finance Minister Arun Jaitley on the scam, Gandhi said "several ministers are coming - social justice minister, defence minister came. But finance minister and Prime Minister, who are responsible, have not spoken a word about it." Referring to a discussion in the meeting in which former Finance Minister P Chidambaram was also present, he said that a scam of this level, a scam of Rs. 22,000 crore, the money which Nirav Modi has taken, and which Prime Minister Modi is ignoring, cannot have been done without a high level protection. "It must have been known to the people in government beforehand. Otherwise, it is not possible because the amount is so huge. So the question is PM made people deposit money in the banking system, in a way he took the responsibility of protecting people's money. And now it has been a failure of that. ""Now PM Modiji is not uttering a single word. He will have to come forward and answer these questions. Why did it happen and how did it happen? And what is he going to do about it. We have come to know that his office (PMO) also go to know about it (the scam) before hand that Nirav Modi had stolen Rs. 22,000 crore, which belonged to the people. But there was no response. So, PM has to explain it to the nation." Asked about allegations of his links with Nirav Modi, Rahul said: "They are trying to divert attention. There is nothing like that. The question is Nirav Modi has taken away Rs. 22,000 crore. PM Modi has to explain why did it happen and what he is going to do about it. "How do you respond to the fact that it started in 2011, Rahul was asked. "No it didn't. The bulk of it started in May, 2015. The first complaint was in May, 2015. And the bulk 90 per cent of the transactions are under this government. This government constantly refuses to accept responsibility. I said in my meetings in Karnataka that the Prime Minister looks at the wicketkeeper and then plays cricket. "The fact of the matter is that the PM has, through his actions, destroyed the financial system of this country. He has demonetised the economy. 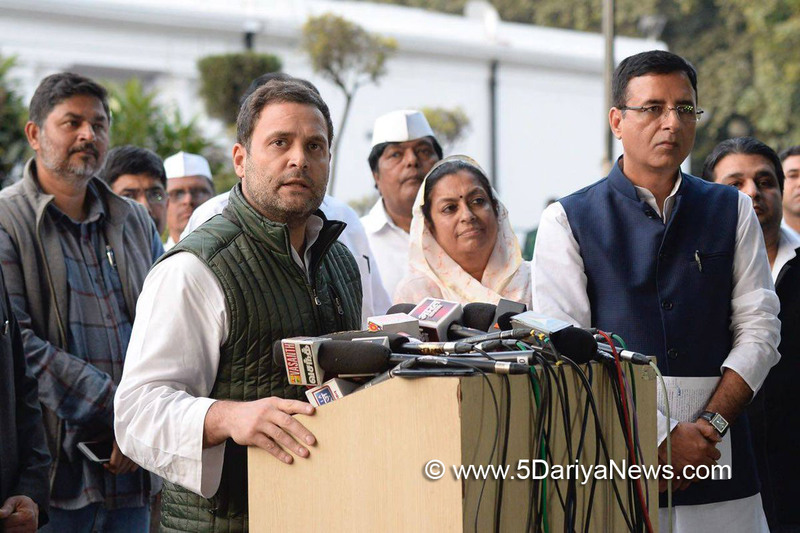 He has taken money from people's pockets and put it into the banking sector and now his friends and cronies are stealing it from the banking sector and the PM is not saying anything," Rahul said.He said he would like Modi to come out, instead of spending an hour and a half explaining to little kids how to take exams, and explain to the people of India what is going to be done to this Nirav Modi and what he is going to do to make sure that the banking system is safe.